Boy the year is going so fast… This month has been my busiest so far. I have managed to secure some sponsorship and support for this project from a number of organisations such the Cyprus High Commission in Canberra, NMIT, Melbourne Polytechnic, Chapel off Chapel in Prahran, the Print Department, ImageScience, The Edge, Regent Framing and Eckersleys Art Supplies. 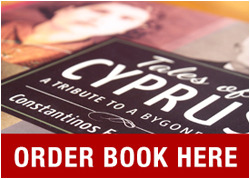 Sadly, (but not so surprising, I guess) I still have not received a response from the Greek Cypriot Community of Melbourne, The Greek Orthodox Archdiocese of Victoria and the Community of Cypriots of Northern Suburbs of Melbourne. Apparently, they are very busy. The great news for me this month is I have booked Chapel off Chapel gallery in Prahran for my Exhibition which will take place in early December. Stay tuned for details. very excited. Now that I have a deadline and an Exhibition Opening – my motivation and determination to achieve my goals has intensified greatly. Nothing like a real deadline to put the fire up my skirt… so to speak. Also this month, my Kimberly 9xxb pencils have arrived from the USA. You can’t buy these pencils here. 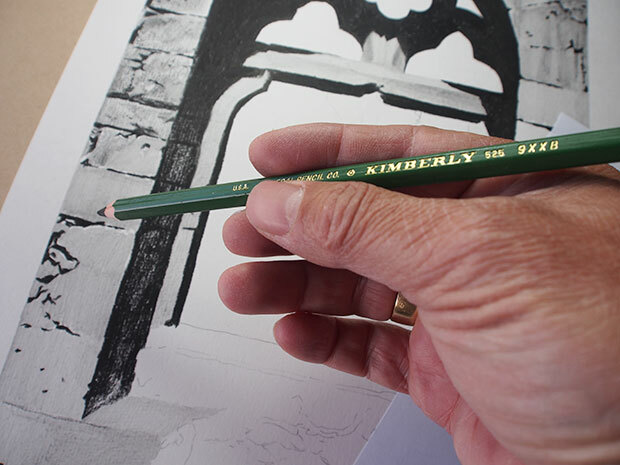 What’s so good about the Kimberley 9xxb pencil? 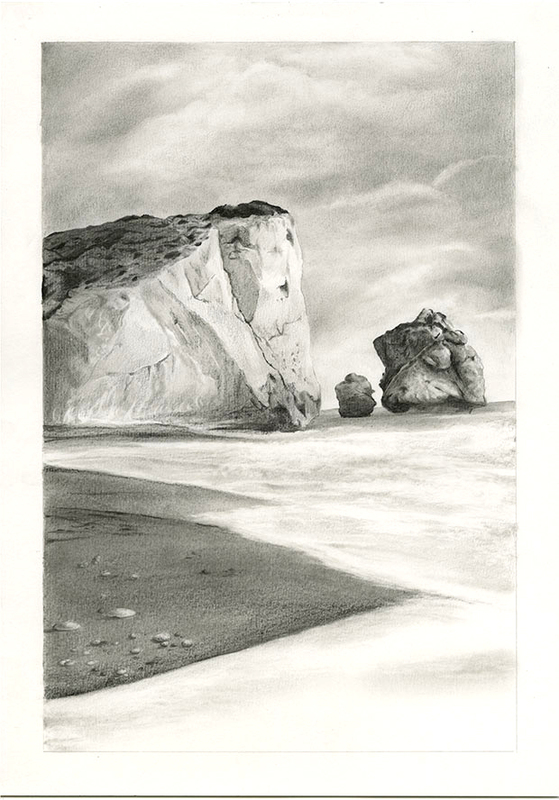 They are jet-black and go on the surface like charcoal, eliminating the dreaded pencil shine that you get with ordinary B-grade graphite pencils. 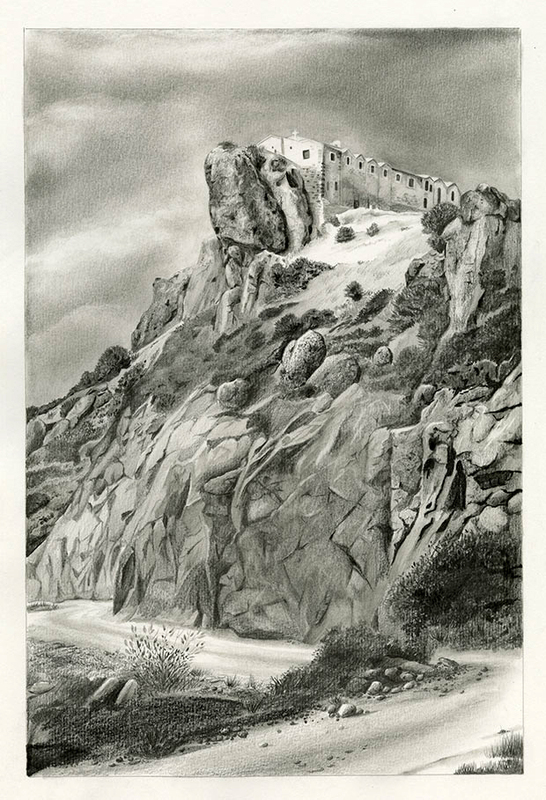 Here is a sample of a drawing I did using the Kimberly pencil to fill in large areas of black together with my top 4 standard graphite pencils (2H, HB, 2B and 6B). 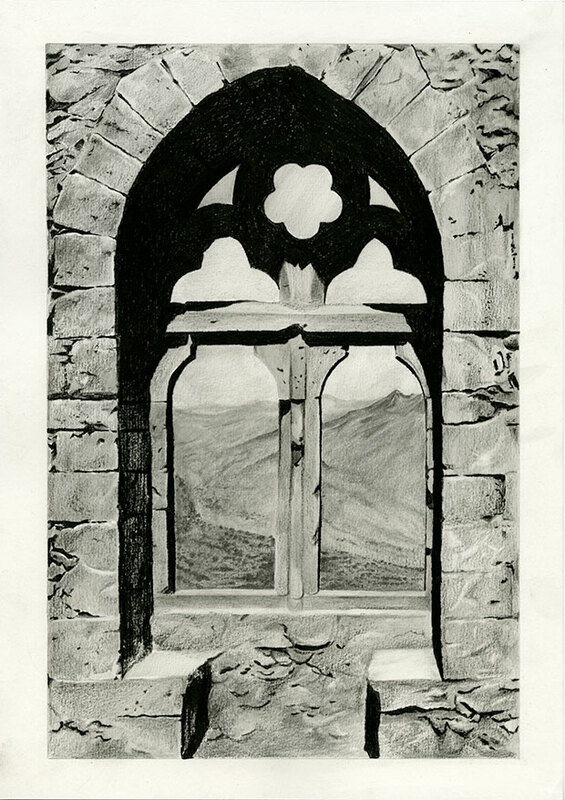 This beautiful window is known as the Queens Window from the famous Saint Hilarion Castle that lies on the Kyrenia mountain range, in Northern Cyprus near Kyrenia. The Kimberly 9xxb was used to fill in the darkest tones of the drawing. Also this month, I was able to spend the Easter long-weekend creating two more drawings. I am not sleeping much these days but happy to be as productive as I can given all the commitments and responsibilities I have in my life. PEDRA TOU ROMIOU – Paphos. I cannot understand why so many young people appear to be bored these days. The last time I was bored was 1972. Thank God I have this interest in History and Art to keep my mind ticking over. Although, I sometimes would like to sleep like a log.